Welcome to the World! The arrival of a new baby is always a joyous time and we have chosen beautifully tactile gift ideas to mark the occasion. 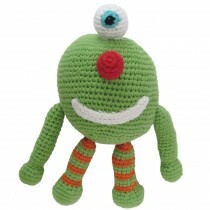 Our menagerie of organic and eco-friendly soft toys are guaranteed to delight. 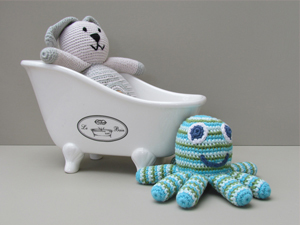 A soft hand crocheted rabbit will be a friend for life or choose a friendly octopus rattle or a wise old owl. For a more inexpensive practical gift our organic cotton baby bibs decorated with images of dogs or birds are charming. The sturdy wooden animals and vehicles are made by disabled men in Tanzania and are constructed without the use of screws or nails, they will be treasured for a life time. Sets of beautiful reusable eco-friendly stickers and cute crochet bunting are an attractive option for decorating the nursery, what ever you choose, all are perfect for the new arrival.